Amazing tours in Nepal and Bhutan. Visit the amazing wonderland of kathmandu valley world heritage sites and beautiful Hill stop Nagarkot. 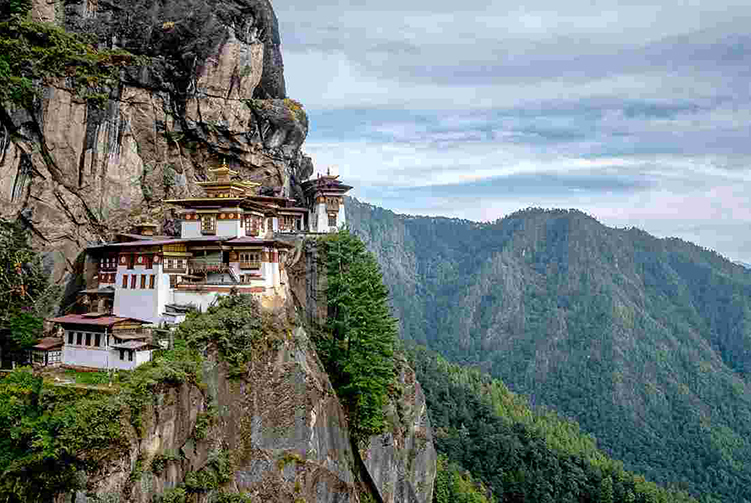 Tiger's Nest/Taktsang Monastery. Hanging onto a precarious almost vertical mountain cliff, it's a spectacular sight in terms of location, setting and history and is one of the holiest sites in the Buddhist arena. Our Highlights Tour of Bhutan is is a perfect introduction to this fascinating country where you have time to explore Paro, Thimphu and Punakha. There are superb views of the Himalaya from Druk Air flight to and from Paro and also on a clear day from Dochu La pass between Thimphu and Punakha. We have arranged for all of our fixed date departures to coincide with one of the main festivals (Tsechus) in Bhutan. Tsechus are annual religious Bhutanese festivals of Drukpa Buddhism held in each district or dzongkhag of Bhutan. Please download Trip Dossier for details of which tsechus are taking place for each departure. Throughout this itinerary you stay at mid-level hotels classified as three star. There is no day to day trekking in this itinerary however there are opportunities for day walks while in Paro, Thimphu and Punakha. You have the option to join one of our fixed date departures or to have a private tour tailored to dates that suit you. Your first glimpse of Nepal. Arrival in Kathmandu and welcome by flowers garlands and transfer to Hotel. Short briefing about Tour and Evening welcome dinner in Typical Nepali Restaurant. Overnight in Hotel Apasara Boutique or Dom Himalaya on B/B Basis. After breakfast- meeting with Cultural Guide then Full day City Sightseeing, Visit Swayambunath (Monkey Temple)- Sightseeing different monastery and stupas, Drive to Boudhanath (Biggest Buddhist Stupa) and sightseeing around the Stupa and Buddhist Monastery, Lunch in Boudhanath, After Lunch visit Pashupatinath (Biggest Hindu Temple in Asia) and sightseeing around the Temples, Hotel Apasara Boutique or Dom Himalaya on B/B Basis. Day 03: Fly to Kathmandu to Paro, Transfer to Hotel. Your first glimpse of Bhutan. On arrival at the Paro International Airport you will be welcomed by your tour guide and driver. Check into your hotel and after a brief rest, start your magical experience of Bhutan by first visiting the impressive Rinpung Dzong/Fortress of Heaped Jewels, a fine example of the ostentatious Bhutanese art and architecture. The Dzong is located in the heart of the town and a few minutes walk through Nyimazam, one of the few last remaining traditional cantilever bridges in Bhutan. Dzongs serve as a monastic institution and as district administrative office. Located above the Dzong is the National Museum that houses various antiques and artifacts of Bhutan and provides a glimpse into Bhutans rich cultural and religious history. Visit the 3 storied Dungtse Lhakhang/temple, built in the mid 1430s by Thangtong Gyelpo, the iron bridge builder, to subdue a demon and the temple is firmly chained to the ground. The three floors of the temple represent hell, heaven and earth and house some of the finest murals in Bhutan. In the evening, visit a traditional farmhouse replete with paddy fields, vegetable garden and farm animals. Enjoy a hot stone bath in a wooden tub, get some cooking tips and help in preparing your dinner which you will eat in the traditional Bhutanese style with the whole family. Morning sightseeing tour of Traditional School of arts & crafts and Tashicho Dzong, and Mini zoo then Drive to Punakha to visiting the Punakha dzong the second oldest in the Bhutan 1637 in middle of the Male and female river by the spritual leader Zhabdrung Ngawang Namgyel, Visit Chime Lhakhang O/N at Hotel Damchen Resort. Enjoy the ride through the mountain ranges. After Breakfast, Visit Chime Lhakhang and Punakha valley then you will drive back to Thimphu Via Douchula Pass continue drive to Paro O/N at Hotel Mandala. After Breakfast, Hike to Tiger nest hike aprox 4 hours. After the hike you may Kichu Lhakhang, National Museum and farm house. O/N at Hotel White Tara. Early morning drive to airport and fly to Kathmandu, Arrive in Kathmandu and Check in Hotel Apasara Boutique or Dom Himalaya on B/B Basis, Free day in Kathmandu. Nagarkot is a popular hill station to see the long range of Himalaya. It is situated 32 kilometers east of Kathmandu at an altitude of 2,175 m above the sea-level. The panorama of the major peaks of eastern Nepal Himalayas including Sagarmatha, (Mt. Everest), can be seen from here. Himalayan peaks like Manaslu (8,463 m), Ganesh Himal (7,111 m), Langtang (7,246 m), Choba Bhamre (6,016 m), Gaurishanker (7,134 m), and Numbur (6,957 m), are also clearly seen from Nagarkot. Breakfast in Hotel, Lunch in Bhakatpur, After Lunch drive to Changu Narayan Temple, After visit Changu Narayan Temple drive to Nagarkot, Check in Hotel Country Villa Nagarkot. Day 09: Drive back to Kathmandu and Check in Hotel. Wake up call to see the Sunrise in Himalaya and photo shooting, Breakfast in hotel, Walk around the Nagarkot then drive back to Kathmandu, Free day in Kathmandu, Tourist place for shopping, Evening Farewell dinner, Hotel Apasara Boutique or Dom Himalaya on B/B Basis. Day 10: Final Departure from Kathmandu for onwoard destination. Airport Pick and Drop in Kathmandu and Bhutan by Private vehicle. Standard Hotel Accommodation in Kathmandu and Bhutan B/B Basis as listed in the Itinerary. Full day guided city tour with world heritage entrance permit as listed in itinerary at Kathmandu and Bhutan. English Speaking Tour Guide in Nepal/Bhutan Tour and Entrance Fee. All necessary Travel permit to Bhutan. Kathmandu- Paro- Kathmandu flight ticket by Dragon Air. Expenses incurred towards usage of landlines, mobiles, walkie-talkies or satellite phones And Internet expenses. Nepal customizetripom duty for import of trekking goods. 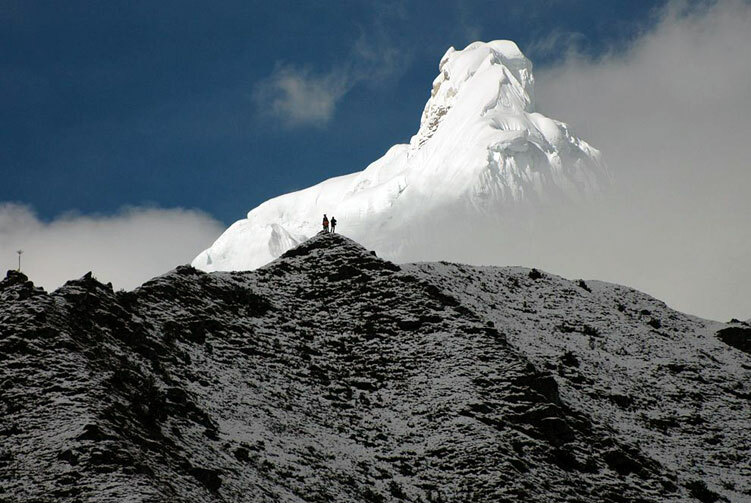 The above trekking Itinerary is a guideline and standard pattern. This tour can be modified according to your time and requirements. The Tour Cost also affect the number of guides and porters. We offer you the best price guaranteed for Nepal Bhutan Cross Country Tour. Included quality wining and dining : a welcome reception with drinks at every hotels of your stay. Throughout your holiday to Bhutan, escorted by one of expert tour guide- your 'travelling concierge', expert guide, consummate facilitator and friend in a foreign land who ensures your journey is as enjoyable as possible. Enjoy the unique comfort of Luxury air conditioned SUV and coach with extended leg room. Airport Transfers as per the scheduled flights. The vehicles are all luxurious and air conditioned catering to the comforts of our guests as well as ensuring a smooth ride over the mountainous and winding roads of Bhutan. With high ride quality and extended legroom you can enjoy the beautiful landscape from the inside of our cars. We have Toyota SUVs, Hi Ace buses and coaster buses with carrying capacity of up to 30 people in one bus. Driven by experienced and licensed drivers we will make sure you enjoy your holiday to Bhutan and the comforts of our luxurious fleet of cars. All tourists must obtain a visa clearance prior to travel to Bhutan. Visas are processed through an online system by your licensed Bhutanese tour operator, directly or through a foreign travel agent. You are required to send the photo-page of your passport to your tour operator who will then apply for your visa. The visa will be processed by the Tourism Council of Bhutan (TCB) once the full payment of your holiday (including a USD $40 visa fee) has been wire transferred and received in the TCB bank account. Once received the visa clearance will be processed within 72 working hours. At your point of entry you will be required to show your visa clearance letter, the visa will then be stamped into your passport. The mountain is sacred to Tibetan Buddhists who believe it is the abode of one of the Five Tsheringma Sisters; (jo mo tshe ring mched lnga) — female protector goddesses (Jomo) of Tibet and Bhutan, who were bound under oath by Padmasambhava to protect the land, the Buddhist faith and the local people. On the Bhutanese side is a Jomolhari Temple, toward the south side of the mountain about a half-day's journey from the army outpost between Thangthangkha and Jangothang at an altitude of 4150 meters. Religious practitioners and pilgrims visiting Mt. Jomolhari stay at this temple. There are several other sacred sites near Jomolhari Temple, including meditation caves of Milarepa and Gyalwa Lorepa. 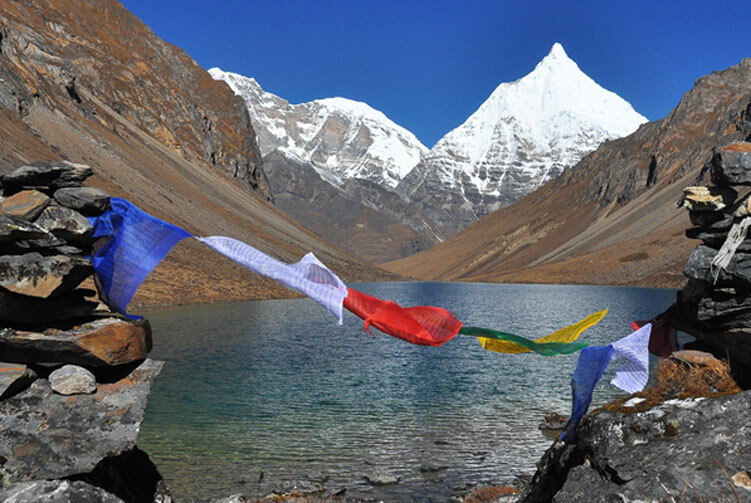 Within an hour's walk up from the temple at an altitude of c. 4450 meters is Tseringma Lhatso, the "spirit lake" of Tsheringma. 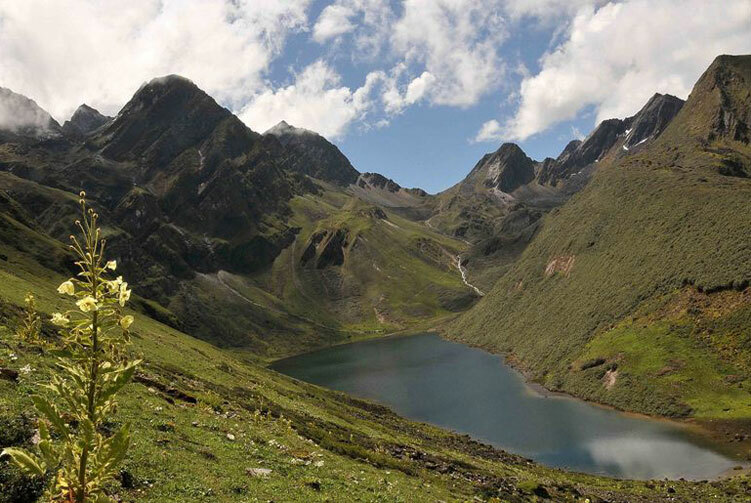 In Tibet there is an annual pilgrimage from Pagri to a holy lake, Jomo Lharang, which lies at c. 5,100 metres (16,700 ft) elevation, just north of the mountain.